Alumnus Masoud House (2010) has been teaching English in China for a few years. I’m an ESL teacher–teaching English as a second language in foreign countries. In short: teach English. But the bigger answer is that there’s a wealth of different opportunities out there in the world. The position I had included teaching English to ages as young as two years old and as old as mid-thirties. Generally I taught in our own private school with a prearranged curriculum and lesson plans, though you’re of course encouraged to tweak them. Often, we were also loaned out for a certain period of time–once a week for a few months, for example–to public schools, specialty language schools, businesses and community centers. The pros and cons vary greatly from job to job: it depends on what country you’re in, what range of students are you teaching (very inclusive, like mine was, or Kindergarten-only, Elementary-only, University-level, etc), and their proficiency in English (beginner, adept, etc). 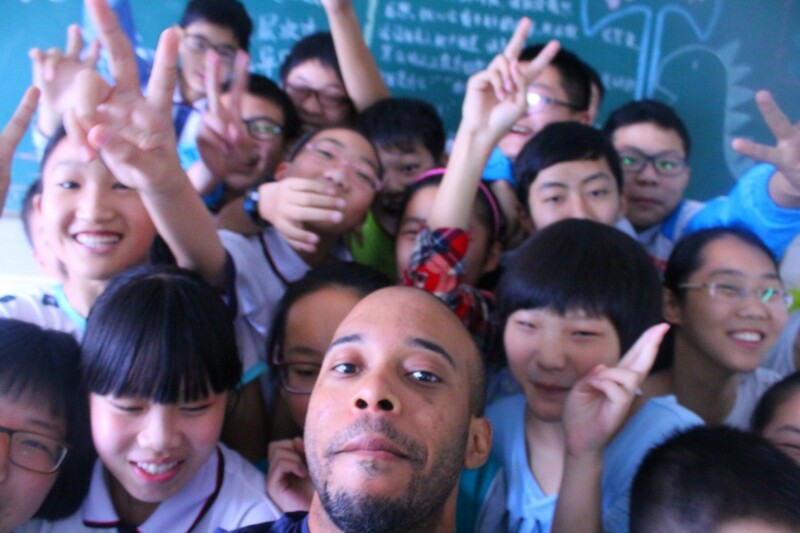 I worked with English First in Wuxi, China. First, the biggest obstacle is the language barrier. It’s great to learn survival basics before you go: how to introduce yourself, the name of common foods, how to say “I want _____”, and numbers/monetary units. This got me a long way before I learned anything else. Secondly is getting used to local culture and customs, which affects everything, from how you acclimate to living in the city day to day, and how you deal with your students. There are so many little things that can affect teaching: how the parents parent and discipline, how students are taught in local schools, what’s expected out of youth in that society, etc. For example, I remember thinking my students would love an upcoming lesson I had on music and movies because in America, we form opinions about that very early in life. We absolutely love media, to a fault. And I was in a modern city, where people watch movies and use the internet and listen to music about as much as we do. But I didn’t realize that in Eastern education, school in most places was less about forming opinions and expressing likes and dislikes, and more about memorization and regurgitation. And so my students found it extremely difficult to express their interests, what they liked, and why they liked or disliked something. It was an afterthought. A non-issue. At least for them at that age. So it really expands your way of thinking how certain factors affect certain things. So your biggest pros will be learning how to adapt. You will constantly be challenged to learn new things about yourself, the world, and the very idea of communication. How to break ideas down to their most basic level. How to explain things to people who either have no concept or no understanding of the words you’re using. Because most schools teach using immersive environments: no translation, only English, as much as possible. The cons are that you may have schools whose management philosophy differs from what you’re used to, you will have frustration about communication, and you will get crazy students. Everyone thinks Eastern education is full of tiger parents and tiger teachers, but from my experience, that’s all an image. Children there are the same as children here, for better and for worse. And it took me a while to learn how to become an effective teacher with terrible two year olds and how to keep bored adults interested in English. But the best part of it is when you start seeing yourself evolve, start getting amazing feedback from parents (like all five stars during open door lessons), and see your students become as great as you know they can be. It’s worth it, all of it, to be out in the world. And not just visiting for a week or two, and going back to “normal” life in the U.S. To live and breathe another culture, to learn a new language and survive for an entire year or more, all of it is just an experience that opens your eyes in a way nothing else can. Hell, just learning the mechanics is important enough for teaching. Though you will be doing more of explaining gerunds and the proper use of conjunctions more so than breaking down Dante’s Inferno. But one of the things that I loved most about the English Major at John Jay was learning how to deconstruct…well…anything, and how to convey ideas. The most important job you will have is learning how to break down grammar, vocabulary and ideas, and teach them to people who may have little or no experience in English. For older classes, teaching them how to do critical thinking is one of the things they value most from a Western education, because, like I said above, their education is based more on memorization and recall than actually thinking about why something is the way it is. And it’s a hard journey for some students, but it’s absolutely the greatest thing you can give them. Lesson plans in the school’s system will give you structure and suggestions.Training will give you some idea of what to expect. But nothing teaches you more than trial and error. You learn from your failures. And then you get better. Communication with other teachers is invaluable, and I got so many tricks and ideas from what fellow teachers shared with me. Some schools have meetings where they workshop ideas. The internet is an amazing resource, and there are many websites where you can find free lesson plans, worksheets, videos, songs and more. Honestly, through Craigslist. And I was so worried it was a scam for a while. But it was legit, thankfully. Since then, I’d highly recommend Dave’s ESL Cafe (http://www.eslcafe.com/joblist/), one of the number one resources in the world for finding ESL jobs internationally. First of all, what you need: a passport, and your degree. Those are the number one things they will require in applications even before you get to negotiations or details about the job. Next, you can get a certification before you go abroad, but some jobs will actually help you get it before you start. It depends. I chose a job with English First, where they said getting a 40 hour TEFL certification was good enough; there are other jobs that may require the full 120 hour TEFL certificate, or CELTA and other certifications. You just have to search and see. After that, most of the rest is easy, and many jobs will walk you through the process. You may need to send over copies of other documents, you may have to get a medical to send them, and you’ll definitely have to interview and offer ideas you may use for teaching in a classroom setting. You’ll also have to get a visa once accepted. Most of your best jobs will be found in China, South Korea and Taiwan: they’re usually the best paying and/or best cost of living, so your money goes a long way and it’s easy to save up cash. Saudi Arabia is also a great place for pay from what I hear. Vietnam, Thailand, Indonesia, and most of that region is great for pay, good cost of living, and Western sensibilities, from what I’ve heard. South America has decent pay, great sights, and of course mostly uses Romance languages, which are much easier to learn for native English speakers than the Asian ones. Japan is one of those places most would love to go, but a word of warning: it’s extremely competitive. There are still some good jobs out there, and if you can find schools looking for American English specifically, that can help give you a boost in job searching. But the cost of living is more expensive–comparable to New York in many ways–and the pay is lower than other regions, unless you live out in a smaller village far outside of the big cities. In many of these places, just being a native English speaker is good enough, even if you don’t have prior experience teaching. Other jobs with better pay and more competition will of course require prior teaching experience, and especially prior experience in an ESL setting abroad. And finally, nearly all jobs will require you to sign a contract. This may be frightening, but it often comes with perks: bonuses for completion, bonuses for attendance and performance, etc. In South America, you’ll find shorter contracts: three months, four, six, and then year by year. In Asia, the vast majority of contracts will be at least a year. Most come with good vacation time and national holidays off, so be ready to spend a long time away from home, but know that you will have time to go home if you’re homesick. Oh, and one last thing: if you go to China, be ready to buy a good VPN (virtual private network). It’s absolutely essential to access Western websites thanks to the Great Firewall of China. The best one, bar none, is Express VPN. It may seem a little costly–about $100 a year–but it’s the best way to use Facebook, Twitter, and all of the other things China has banned access to on the mainland. Express VPN offers dozens of servers from around the world, great customer service, and is one of the only servers that never gets taken down.